North Korea has reported to the international agency on animal health that the country has seen no new bird flu cases since early last month, agency officials said Tuesday. Ri Kyong-gun, the North’s agricultural department chief, said, in a report sent to the World Organization for Animal Health (OIE), “There are no new outbreaks” as of May 22, some 10 days after a duck farm near Pyongyang reported animals showing symptoms of avian influenza, known as the H5N1 virus. While the source of the outbreak and its origin are not yet known, the communist country “humanely culled all ducks in the infected cages and has vaccinated 500,000 heads nationwide,” the official said in the report. According to the comments there, weekly follow-up reports will be submitted, “as the event is continuing.” The May 22 report is the latest one available on the OIE website. The international agency earlier said the highly contagious virus was presumed to be spread by migrating birds from China, where its Tibet Autonomous Region saw 35 chickens die at a farm after showing symptoms of avian flu. In a move to conduct an on-spot inspection into the recent cases and to help North Korea with quarantine activities, three experts from the OIE and the Food and Agriculture Organization made a one-week trip to the communist country from June 3, the Washington-based Voice of America said. An outbreak of the avian flu led to a mass cull of 210,000 chickens in North Korea back in 2005. Pyongyang, May 20 (KCNA) — The Democratic People’s Republic of Korea has been making big efforts to prevent the spread of the bird flu virus. 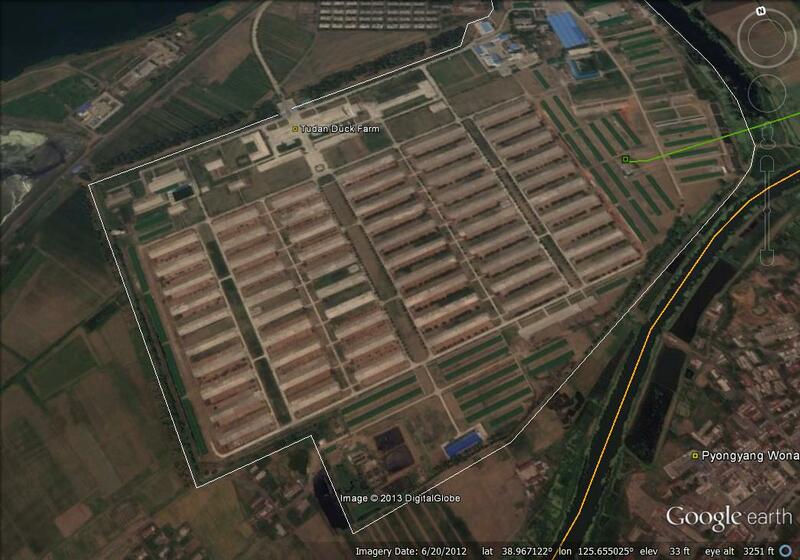 According to an examination made by the Central Epizootic Prevention Center and the Veterinary Institute under the Academy of Agricultural Science on May 7, it was found that ducks in the Tudan Duck Farm in Pyongyang were infected with the H5N1 virus by migratory birds. They briefed UN bodies concerned on this situation while taking steps to kill as many as 160 000 ducks in the farm and quarantine and disinfect it. More than 1 360 veterinary epidemic control teams are now working throughout the country to keep a close eye on poultry and movement of wild birds. Efforts are made to raise the diagnosis capability of provincial epizootic prevention organs and increase preventive medicines. Meanwhile, preventive measures are being taken against H7N9 virus under the direction of the State Emergency Anti-epidemic Committee. They include checkup of persons from the bird flu virus-hit areas, test and quarantine of poultry and restriction on movement of living fowls. A strict step was taken to hedge fowl, duck, pigeon and other domestic poultry off from the outer world. Intensive hygienic information service is going on among inhabitants. Additional information as the WSJ Korea Real Time. 1. Existing Sanctions and Reporting Provisions Related to North Korea (thorough, but does not mention that the DPRK never obtained MFN or NTR status with the US, making it subject to the higher column 2, Smoot-Hawley, tarrifs. 2. Briefing on North Korea With Special Envoy for the Six-Party Talks Ambassador Sung Kim, Assistant Secretary of State for Public Affairs Sean McCormack, Assistant Secretary of State for Verification, Compliance, and Implementation Paula DeSutter, and Acting Assistant Secretary of State for International Security and Nonproliferation Patricia McNerney. 3. U.S.-DPRK Agreement on Denuclearization Verification Measures. The reason: Fear that they will be used for biological warfare. Under this little-known policy, North Korea, Iran, Cuba, Syria and Sudan may not get the vaccines unless they apply for special export licenses, which would be given or refused according to the discretion and timing of the U.S. Three of those nations – Iran, Cuba and Sudan – also are subject to a ban on all human pandemic influenza vaccines as part of a general U.S. embargo. Under normal circumstances it would take at least six weeks to approve export licenses for any vaccine on the list, said Thomas Monath, who formerly headed a CIA advisory group on ways to counter biological attacks. All such decisions would follow negotiations at a “very high level” of government. North Korea has agreed to all U.S. nuclear inspection demands and the Bush administration responded Saturday by removing the communist country from a terrorism blacklist. The breakthrough is intended to salvage a faltering disarmament accord before President Bush leaves office in January. “Every single element of verification that we sought going in is part of this package,” State Department Sean McCormack said at a a rare weekend briefing. Verifying North Korea’s nuclear proliferation will be a serious challenge. This is the most secret and opaque regime in the entire world,” said Patricia McNerney, assistant secretary for international security and nonprofileration. Proponents of de-listing say it is an important step in accomplishing the goals of the six-party talks which are ultimately aimed at realizing a denuclearized Korean peninsula. Critics of this agreement claim that it addresses only the DPRK’s plutonium program while ignoring nuclear proliferation and uranium enrichment. The demand that inspectors leave the whole complex, which is the source of the country’s weapons-grade plutonium, followed a Sept. 24 instruction that monitors quit the reprocessing plant. The new orders will prevent UN personnel from seeing whether North Korea is removing spent uranium fuel rods from cold-water holding tanks. Spent uranium can be turned into plutonium. Despite these recent developments, or maybe because of them, the Bush administration quickly negotiated a de-listing agreement with Pyongyang and spent the last few days selling it to other governments involved in the six-party talks. Though South Korea supported the move, the Japanese government was divided. Japanese Finance Minister Shoichi Nakagawa (a North Korea hard-liner) called the move “extremely regrettable” as Japan was using US terrorism de-listing as leverage to discover the whereabouts of kidnapped Japanese citizens. This leverage is now gone since the next president of the US will not likely go through the effort of adding the DPRK to the list again. Other members of the Japanese government, however, believe there will not be any resolution to this issue until the nuclear issue is resolved. Countries determined by the Secretary of State to have repeatedly provided support for acts of international terrorism are designated pursuant to three laws: section 6(j) of the Export Administration Act (which expred in August 2001), section 40 of the Arms Export Control Act (wikipedia), and section 620A of the Foreign Assistance Act. Taken together, the four main categories of sanctions resulting from designation under these authorities include restrictions on U.S. foreign assistance; a ban on defense exports and sales; certain controls over exports of dual use items; and miscellaneous financial and other restrictions. Designation under the above-referenced authorities also implicates other sanctions laws that penalize persons and countries engaging in certain trade with state sponsors. Currently there are five countries designated under these authorities: Cuba, Iran, North Korea, Sudan and Syria. As discussed before (here and here), the DPRK still faces a myriad of legal barriers which restrict it from accessing global trade and financial markets, including the US Column 2 tariffs (Smoot-Hawley Tariffs), US Treasury sanctions, bilateral Japanese sanctions (renewed on Friday), and recent UN resolutions 1695 and 1718. In other words, the DPRK does not have much to gain financially from de-lisitng. Here is the initial executive order to begin de-listing. Now that the US terrorism list is one country shorter, who remains? Cuba, Iran, Syria, Sudan. North Korea on Tuesday asked South Korea not to bring poultry products to the inter-Korean industrial complex in Kaesong, a North Korean border town, in an attempt to prevent the introduction of bird flu into the communist state, the Unification Ministry said. The ban from the North Korean quarantine office in the Kaesong complex includes birds, poultry and eggs, and will go into effect on Saturday, ministry spokesman Kim Ho-nyoun said. There have not been any cases of bird flu reported in North Korea. South Korea sends some 8.5 tons of chicken and 127,000 eggs every month to eateries in the complex, the ministry said. If South Korean chicken has been taken off the menu in the Kaesong Zone, maybe they will replace it with some of that new low-cost American beef that should be on its way soon! North Korea is becoming more transparent and effective in dealing with disasters, spurred by both internal and external factors, an Asia-Pacific regional specialist said in his latest paper. Dr. Alexandre Mansourov, a securities studies professor at the Asia-Pacific Center for Security Studies (APCSS) in Hawaii, noted five trends in the North Korean government’s responses over the past decade to nationwide shocks, including floods, typhoons, drought and avian influenza outbreaks. Increasing transparency is one of the trends, with Pyongyang more quickly admitting to disasters that have struck the nation, he said in a paper (download here) released last week through the Korea Economic Institute in Washington. It took North Korea several years to admit the impact of natural disasters in the mid-1990s that led to massive starvation and chronic food shortages. But in August 2000, when it was hit by Typhoon Prapiroon, North Korea released the news three weeks after it occurred, and in the two following years, when other typhoons struck, North Korea reported it within three to six days, Mansourov said. Pyongyang immediately acknowledged flooding in August 2007, he said. North Korea is also showing institutional knowledge and a capacity for disaster management, with new organizations growing out of a decade of learning and experience, such as various provincial centers, the professor said. The North Korean Red Cross Society has been exceptional, he said, working with the International Federation of Red Cross and Red Crescent Societies, and has made itself the leading agency in disaster preparedness and response. Inter-agency coordination has also increased, with deputy prime minister-level working groups working closely together in each disaster since the flood of 2001, as there are preventive programs through which basic relief supplies are stored in town and villages. For example, the 10-year strategy against avian influenza, worked out by the emergency commission in 2005, would have been unthinkable a decade ago, Mansourov wrote. Another notable trend is the increasing cooperation between the North Korean government and international humanitarian community, gradually allowing joint needs assessments and monitoring, he noted. Mansourov argued that external factors helped bring about the changes. “International factors did make a difference in what happened in (North Korea), especially through the introduction of innovative ideas and dissemination of best humanitarian practices,” in addition to foreign aid, he said. The scholar also argued that while the country’s top leader, Kim Jong-il, does control any institutional changes, there is also adaptation driven by needs. “There has been some degree of autonomous institutional learning and adaptation; it is incremental in nature and caused by both positive and negative feedback from the environment regarding institutional performance in crisis situations,” he said. North Korea recently issued a new postage stamp on the prevention of bird flu, Choson Sinbo, a pro-Pyongyang newspaper published in Japan, reported yesterday. The price of the stamp is 85 North Korean won. In February 2005, bird flu outbreaks were reported in poultry farms near Pyongyang. Sources close to North Korea’s affairs have said more than 210,000 chickens have been slaughtered to contain the disease. North Korea finished constructing a hospital ward for patients with bird flu and other contagious diseases with financial support from the World Health Organization (WHO), a media report said Sunday. The WHO had been helping North Korea to build the isolation ward inside a Pyongyang hospital since June, said the Chosun Sinbo, published by the General Association of Korean Residents in Japan. 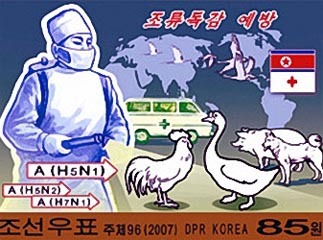 In early 2005, North Korea reported an outbreak of avian influenza at several chicken farms in Pyongyang and asked for help from the international community. “As part of preventive measures against the spread of contagious diseases, this ward was constructed in cooperation with the WHO,’’ the pro-Pyongyang newspaper said. The report, however, did not give details on when the hospital ward would open officially. According to the newspaper’s earlier reports, the isolation ward in Songsin Hospital will be a single-floor building with eight rooms covering 695 square meters of land. A Chinese delegation of avian influenza experts arrived in the North Korean capital of Pyongyang on Sunday, according to state media there. The Chinese group visited the statue of former North Korean leader Kim Il-sung in downtown Pyongyang, said the (North) Korean Central Television Broadcasting Station, monitored here, but it did not report the purpose of the group’s visit. The Chinese government has donated equipment and material to North Korea to conduct an examination for bird flu, and on Wednesday signed an agreement with Pyongyang for cooperation regarding examination and possible quarantine measures. North Korea has not reported a case of bird flu ever since an outbreak earlier last year was brought under control. North Korea received aid from China to help its fight against bird flu which has hit the impoverished state in recent years. The Chinese aid, which included test kits, “will help prevent the spread of bird flu in the country via its border and trading ports,” the Korean Central News Agency said. North Korea has recently launched public awareness campaigns against the avian influenza virus and has focused its efforts on isolating chickens and ducks from wild birds. No bird flu case has been reported so far this year. The PDRK reported virus outbreaks in 2004 and 2005. Early this year, a Japanese human rights activist said a North Korean woman had been infected in December. But Pyongyang has yet to confirm the case. You are currently browsing the archives for the Avain Flu category.